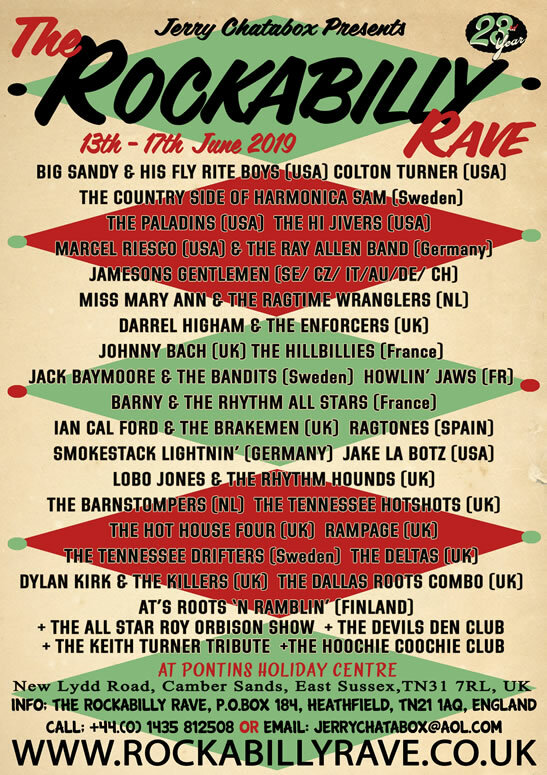 A prevew of the multitude of magnificent bands playing at the Rockabilly Rave in Camber Sands UK, 13-17 June 2019. Plus a little discussion of vexillological matters. Cacophonous confedracies from Dylan Kirk and The Killers, Barny and The Rhythm All Stars , Colton Turner, The Highjivers, Johnny Bach and his Moonshine Boozers, Jack Baymoore And The Bandits, Miss Mary Ann And The Ragtime Wranglers, Darrel Higham, Paladins, Ian Cal Ford and The Brakemen, The Country Side of Harmonica Sam, Big Sandy and his Fly-Rite Boys, Marcel Riesco, The Barnstompers, The Hillbillies, The Tennessee Hotshots, Lobo Jones, Smokestack Lightnin, Jake La Botz, The Hot House Four, The Ragtones, The Deltas, and the Tennessee Drifters.